Was watching the best of X-Factor the other day, and two of the female contestants quipped about their age. Both Sam Bailey (Aged 35) and Rachel Potter (Aged 29) commented on their age and how it might be a problem. Both have AMAZING voices. To me, having anxiety about one’s age is just another excuse to sit down, shut up, and not do whatever it is you want to do. I totally get that physical appearance is a big deal for women in particular, not just because of the way the industry works. It’s everywhere. Reflected in advertising, on several videos (e.g. the comments revealed how obsessed some were with these ladies’ looks **instead of** their voices), social pressures, family nagging, etc. etc. etc. Sad, sad, sad. Do we REALLY need another excuse to not reach for the stars? That’s a big, fat “NO!” from me!!! Doesn’t matter if it’s singing or running or what have you. If you want to belt it, belt it. Run a marathon, run it. Write a novel, write the darn thing! SHEESH. One life. That’s what you got. That’s it. Age is only a limitation if you let it be. SERIOUSLY. So tired of hearing: “I’m too old, to…” Swap that around for a second. First, it’s “I’m too young, to…” Then you’re auto-magically “too old” because you’re out of the 18 to 25 range? No life is measured by a eight-year span. That’s just marketing saying youth is awesome so you buy more to feel young. But your life ain’t over if you hit 26. Yeesh. If that were true, then we’re pretty much all zombies just waiting to be shot. Besides, you know who becomes successful? Achieves their dreams? People who are persistent regardless of age. That’s who. Sans marketing. Sans society’s opinions. Just plain old one foot in front of the other, no matter how long it takes. Keep doing that, and eventually a door will open. P.S. Totally in love with Nicole Scherzinger after watching her on this show. P.P.P.S. I may have turned my espresso into regular coffee on accident this morning. Caffeinated Beverages Consumed: I think there’s something else in my coffee. Where’s a chemist when you need one. It’s the weekend before New Year’s and I’m (you probably guessed it) writing and revising and rinse and repeat. Right now, I’m in the post-holiday crunch (as my friend Jim Zubkavich pointed out on Twitter). I’ve mentioned this before, but when you freelance either part-time or full-time, there’s no end to what you need to do because your hours aren’t regular like a 9 to 5 job. Or, to put it simpler, deadlines rule my life. HAH! What’s nice about this time of year is the quiet. It really is the calm before the storm for me. As soon as January hits, it’ll be non-stop craziness — and I’m so ready for it. 2014 is going to be very exciting! Caffeinated Beverages Consumed: Coffee in moderation. Thanks to Amazon’s lightning deals on Black Friday, I was able to pick up the legendary edition of Skyrim for $30. I hadn’t played the game yet for a few reasons. One, buying games when they debut is pretty costly. And two? Time, really. But, with it being so cold outside, I figured an hour or two would be a good mental break. My fear with this game, is that I’d get immersed in the world of Skryim and then never leave. I’m not going to have that problem, though, not with this epic sweeping game. After playing for two hours last night in first person, I realized that a) I really don’t like playing first person in general and b) even with switching to third, the non-linear form of storytelling offers a more well-rounded game experience. This game is impressive on many levels. Graphics, the depth and breadth of character options, an expansive bestiary — the only problem I had was readability and the way the fonts appeared on my screen. Non-linear, non-sequential storytelling is extremely complex to put together. Many games use sidequests or miniquests to flesh out the primary storyline. Of course, it depends upon the scope of the game. In general, there’s often a stricter limit on how far you can go off the beaten path and, more importantly when. Skyrim doesn’t have that problem, because its construction gives me the illusion that it doesn’t matter what choices I make and when, the story will proceed the way “I” want it to. I’m in deep appreciation of how far off the beaten path I can go. There is no pathing issues in this game, either, where I can’t go up a ridge because that’s not the gameplay area I’m supposed to be in. It’ll take me forever and a day to get through everything and even then I know I’m likely going to miss something. If you haven’t played and want to pick up a copy, I would say that “YES! It is new gamer-friendly.” This game is more about strategy than up up down down left right A A B B Select Start. Highly recommend the guidebook, though, for if you go too fast in the beginning you’ll gloss over some of the training or, if you’re like me, get worried that you missed something. Caffeinated Beverages Consumed: A couple of cups of coffee. Folk do what they can to scratch out a living in the ’Verse. Seems like some folk push their luck to scrape by in these tough times. Maggie Miller’s bad history and rotten luck are keeping her from achievin’ her dreams. She wants to get out of the Georgia System to make a fresh start out on the Rim, but she needs three things to do it: a hidden pile of cash, a ship she’s hidden with an old flame, Hollis Mason, and enough leftover credits to wipe Ma Millers’s medical bills clean before she goes. The Crew will have to dig for treasure, outwit a wily Alliance officer, and steal a ship hidden in orbit to help Maggie safely on her way. Trouble is, there’s a kind of hitch: Hush Jackson, a tough-as-nails bounty hunter who’s hopin’ to cash in on Maggie’s head. Will the Crew turn Maggie over for the bounty? Or, will they help Maggie out and pray there is enough cash left over to cover their costs? Friends in Low Places is part of the Echoes of War role-playing adventure series, which is centered on a common theme: the Unification War. Echoes of War adventures include basic rules to get you started. Main characters are found in the Serenity Crew, which is available separately. All releases in the Echoes of War line are compatible with the FIREFLY ROLE-PLAYING GAME, which is based on the television series by Joss Whedon. Like so many of you, I fell in love with Firefly when it first aired. It was my new favorite show and I was nothing short of heartbroken when it was cancelled. The end, but not so fast. Fans asked, demanded, screamed for more and more we’ve been given. 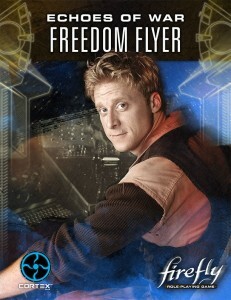 I hope you get the chance to check Freedom Flyer out. It is, as they say… SHINY!